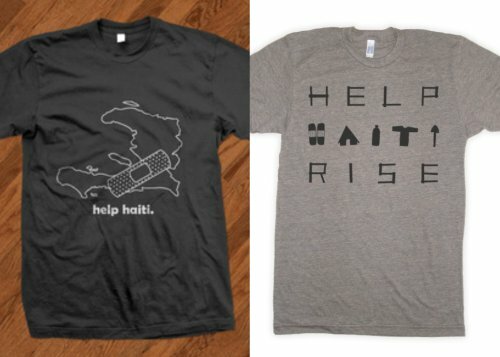 poor ol' haiti sure needs all the help she can get right now. i feel so sad when i see the images of people holding children, just sitting in the middle of the road because they don't know where else to go. i can't imagine being in the same situation. but, there is something small we can do. yep, buy a $20 tshirt (the one on the left) here from double take clothing. the guys had the tshirts ready for market in 2 hours and 100% of the money is going direct to haiti. come on, you or your fella can always use an extra tshirt. help. update: the tshirt on the right as first seen here is only $15 from fretto prints, who are also donating 100% of the money. I like this! I'm going to put this on my site too if you dont mind! go for it randi.. spread the word! wow, great job - especially for two hours! am off to check it out and will reblog later. My boyfriend uses this screen saver! I love it.